While most dogs do just fine out in the sun, there are a few important things you should know about dog sunburn and dog skin cancer. Beyond the facts, it’s up to you to do everything in your power to protect your dog from ever getting a sunburn in the first place. Most people don’t realize that dogs with short legs are more susceptible to sunburn than other dogs. Why? Because their bellies are closer to the ground, therefore it’s easier for the tummy area to get sunburn from the sunlight being reflected off the ground. #1 – Apply a dog sunscreen. When should sunblock be applied? You’ll want to put a quality dog sunscreen on each time before your dog goes outside — especially if your dog will be spending a lot of time out in the sun. It’s not always a good idea to use a human sunscreen on your dog. The reason? 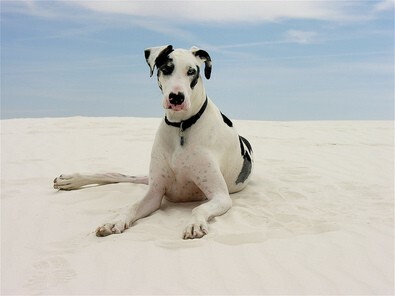 Many human-grade sunscreens are toxic to animals, especially those that contain PABA or zinc oxide. That said, as long as your dog doesn’t lick the sunscreen itself, then baby sunblock and those made for sensitive skin would probably be fine for your dog. #2 – Keep your dog indoors during the hottest part of the day. That generally means from 10AM to 3PM and applies year-round — because sun exposure is sun exposure, regardless of whether it’s summer, winter, spring, or fall. If your dog will be in the backyard for long periods of time, make sure to provide some shade for your dog. #3 – Don’t cut your dog’s fur too short. Your dog’s hair is one of the things that helps to protect the skin from sun exposure. If your dog has at least half-an-inch of fur, then it would be highly unlikely that sunburn would ever occur. 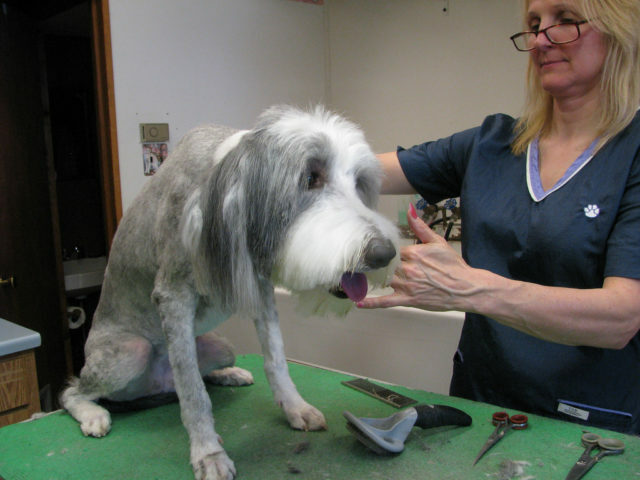 However, if your dog is shaved, then be very careful whenever he is exposed to the sun. That said, fur alone isn’t the best source of sun protection. #4 – Buy sun protection dog clothes. In addition to mid-length dog shirts, look for a full-body dog sunsuit. Ideally, you want at least 30+ UPF (Ultraviolet Protection Factor). Dog sun suits with 50+ UPF are best. 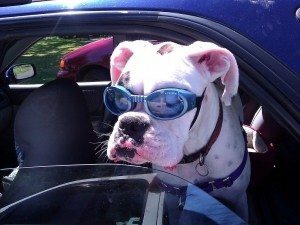 #5 – Protect your dog’s eyes. The eyes are a common spot for canine melanoma. That’s why doggie sunglasses, like Doggles, are so popular. They’re the world’s only eyewear made just for dogs. Here’s how to get your dog to wear sunglasses or goggles. What If Your Dog Gets Sunburned? If your dog does happen to become sunburned, 100% pure Aloe Vera gel is the best way to quickly and easily soothe your dog’s skin. Here’s what you need to know about the different types of dog sunburn, and how to professionally treat it. Does Your Dog Need Sunscreen?